In 2015, the Borexino collaboration reported (Physical Review D 92, 031101, 2015) an improved geoneutrino measurement from 2056 days of data taking, with an actual exposure of (5.5 ± 0.3) × 1031 proton-per-year. 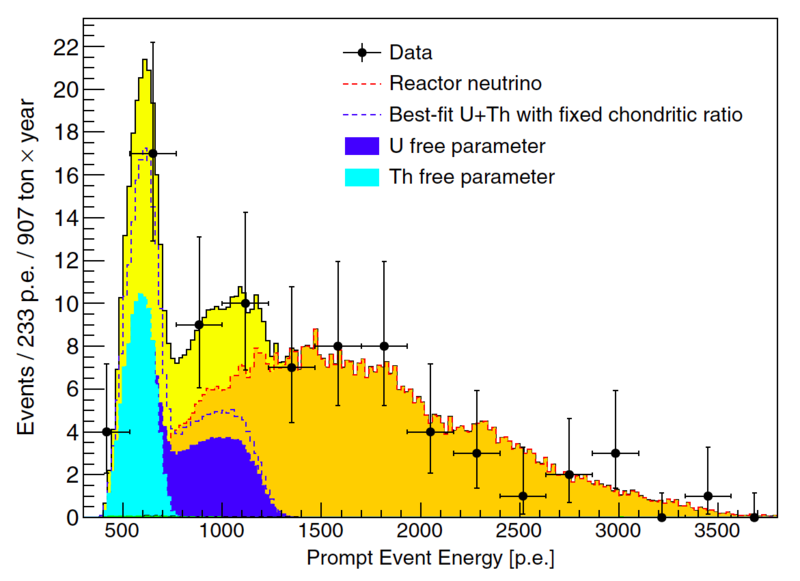 The null observation of geoneutrinos with Borexino alone was excluded at 5.9 .
error size on the y axis (bottom and top different values since we used Poisson). The data related to all but the geoneutrino curves describe the result of the fit with U and Th kept as free fit parameters. The geoneutrino component instead is the result of a fit in which U and Th were fixed to the chondritic mass ratio. All fit were performed with an unbinned maximal likelihood. The energy, expressed in units of photo-electrons p.e. (about 500 p.e./MeV), of all the 77 candidates used in the analysis is instead available here.